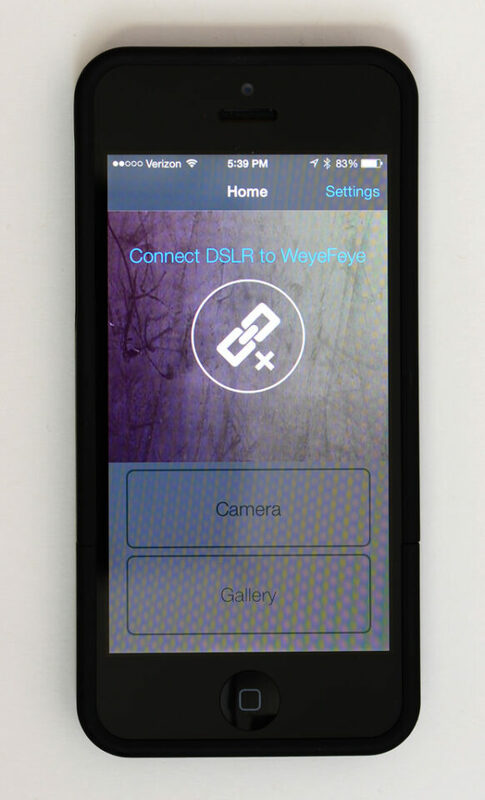 This is a review of Weye Feye product (usage with Nikon D800 camera, iPhone 5 & iPad 2). Weye Feye is a wireless and remote control unit for a DSLR. 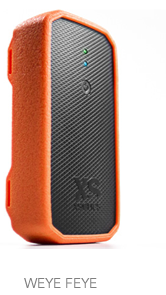 This product is made by a company called “XSories”. I think this is a French company with a subsidiary located in Hong-Kong. Another device providing similar functionality (and known better than Weye Feye) is CamRanger. The primary reason why I started looking at an external camera control unit was pretty simple. Prior to purchasing and using the D800, I was using Olympus E-5 cameras (still use them). Olympus E-5 has a fully articulating LCD screen. Having this fully articulating screen was and is very convenient, as I often take shots with strange angles, especially low to the ground. Most of the semi-pro DSLRs (just about all brands) do NOT have articulating screens. The absence of this functionality on semi-pro and pro cameras actually infuriates me, because it significantly limits the artistic ability of the photographer. Why do I have to get down either on all fours or my stomach or in a crouching tiger position in order to get the shot I need? Please, put articulating screens on these cameras! So when I got my D800, I was searching for a long time for a device that could “replicate” the articulating screen of my E-5s. There are many various add-ons available, but all add significant bulk to the camera, require separate batteries and seem very cumbersome. Most of my photography is done in an external, non-studio environments, so I try to limit the bulk of my equipment. When CamRanger device came out, I was very excited (and so were many others). One of the primary reasons was the ability to use your mobile phone as a remote extension of the camera, obviously including the screen, which, of course, was completely articulated! 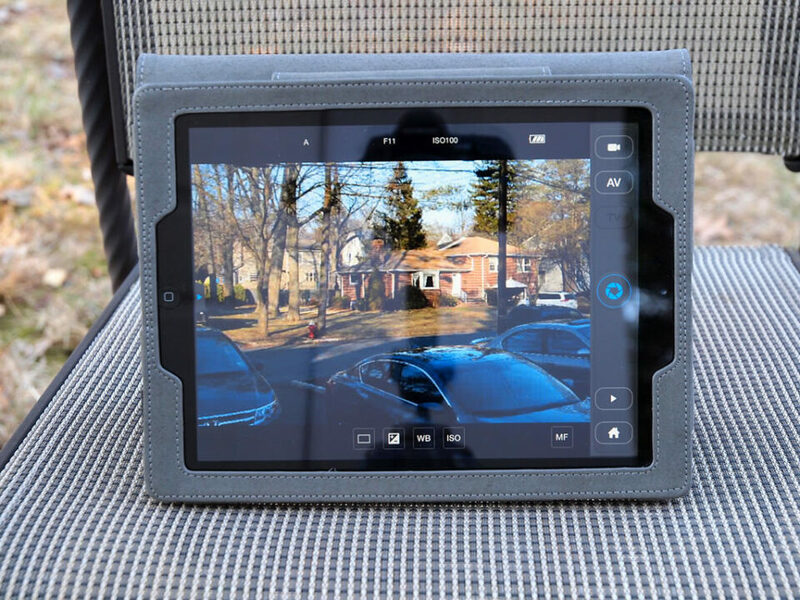 But as I was reading numerous reviews of the device, it became obvious that CamRanger had some significant limitations, cheaply made and yet fairly expensive. Nonetheless, I decided to give one a try and was reading yet another review in which the reviewer mentioned an “unknown” brand – Weye Feye. To be fair and state it up-front, I did not have an opportunity to test a CamRanger device yet. I started looking at this newcomer product and became very intrigued by the information available. However, available reviews were limited and it seemed that not many people have heard and especially used this device. As I was researching Weye Feye, Amazon happened to have one at a very reasonable price (especially compared to CamRanger). So I pulled the purchasing trigger and got one. 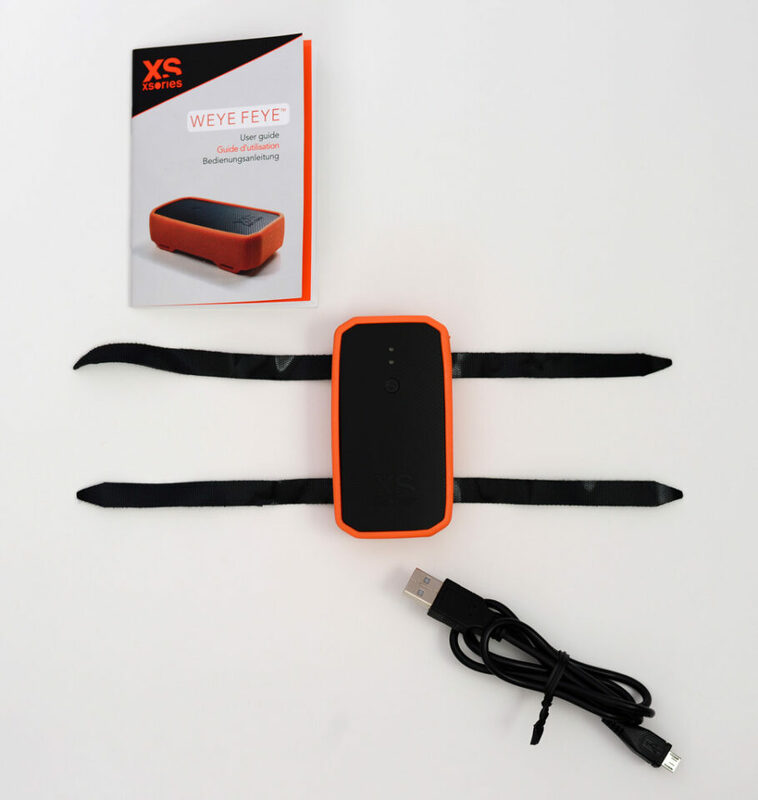 Weye Feye unit, Mini-USB to regular USB cable, User guide, Warranty card (warranty is one year). The User guide is in three languages (English, French & German), is very, very basic and does not provide extensive explanation on the actual use of the unit, especially application. XSories needs to do a much better job in creating a useful manual. For example, application screen shots seem to be for Android application only and do not have screen shots for iPhone. The unit itself is fairly small (about 2”x3.5” and about ¾” thick). It is really solid yet light and all electronics are encased in a thick black plastic box which seems to be completely sealed (no screws, no easy way to pry it open). The black box is seated in a bright orange rubberized cover – so it will be easily seen if dropped. The unit has 2 openings – one a regular USB port (bottom of unit), the other a mini-USB port (side of unit). When sitting in its rubberized cover, the mini-USB port has a flap-like cover, while the regular USB port is open. The rubberized cover has 2 Velcro strips that can be used to mount the unit (usually to a tripod). I do not believe the unit is weather proof, but I think it can probably handle light drizzle (as long as regular USB port is covered). I have not tried this and if I was to take it into significant weather elements, I would probably cover it in some sort of a plastic bag. Normal product operating temperature is listed between 0 – 40 degrees Celsius. The Weye Feye physical unit has only one tiny power button (in the middle of front panel) and two small LED lights. It also has a pin-hole on the side used to perform a hard reset of the unit. LED lights provide various status (power on, battery power indicator, etc.). The unit has an internal, non-user replaceable battery. According to the manual, it takes about 4 hrs to charge a fully depleted battery. When I received my unit, it had some charge and I charged it fully by plugging it via mini-USB port to my regular computer’s USB port. I think it can also be charged via any regular wall charger that has a USB port, but I have not tried this method yet and the manual does not provide any recommendations for a specific charger. Choosing the Camera option brings up the Live View camera display (make sure the lens cap is off) with various camera controls. I apologize in advance for the quality of the images – as you will see, shots of iPhone and iPad screens show discoloration and lines – I believe this is due to the refresh rates of the screens and not using the proper technique to minimize this effect. You will notice that my finger is not visible on the first image of the iPhone – this is the effect of a slight delay (about a .2 second lag) between clicking the shutter icon on iPhone and the actual shutter being activated on the camera. Images below show remote control options available in Weye Feye iOS application. I used my iPad 2 in these examples to provide better visual representation, but the functionality on iPhone is exactly the same (with some icons being in slightly different locations). This is the default remote control screen. You will notice a white square on the iPad screen – this is the focus point. In my configuration (using D800), you can tap anywhere on the screen, the white square will shift to the new location and focus will be re-acquired (camera has to be in the auto-focus mode). Note: most of these functions will not work with a manual focus lens. I have not yet tried what functions, if any, will work with a manual focus lens. To take a picture, you tap on the iris/shutter icon. As I’ve mentioned before, there is a slight lag between tapping on the icon and the actual activation of the shutter on the camera (about .2 seconds). So if you are planning to take action shots with this setup, you will have to account for this lag. Note: Focusing specifics – if you tap once, that’s where the focus will be acquired. You can tap twice anywhere on the screen to zoom in at 100%, but that action will NOT shift the focus to that location. You also tap twice to get out of the zoom mode and again, that will not shift the focus from the original focus point acquisition. You have to tap once for focus to be changed/re-acquired. Also, you will notice that while in zoom function, VIDEO (video camera icon) is grayed out. Tapping the home icon will bring you back to the application menu (see iPhone picture above). You can also utilize manual focus (for example, on an AF-S lens) to achieve critical focusing, especially once you zoom on a specific location in the image. Single arrow icons provide you with very small focusing steps, while other arrow icons increase the focusing motor steps. I can see this mode being very useful in Macro-Photography for image stacking. Wireless File Tethering (download of files as soon as the image is taken) works directly with either iPhone or iPad (I presume Android devices as well, according to the manual). 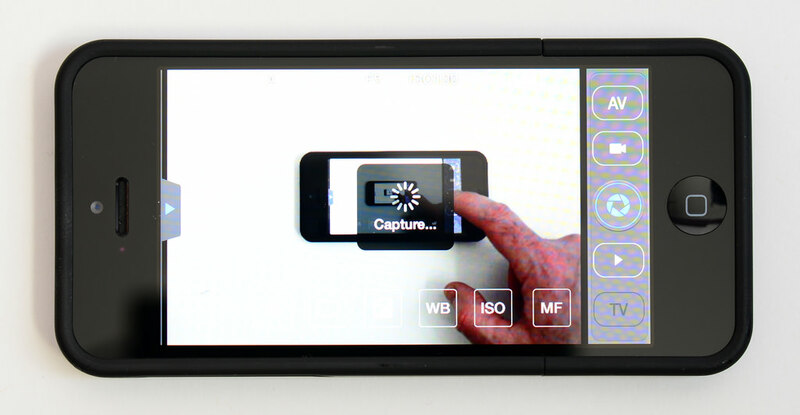 This means that the image file can be wirelessly loaded directly onto iPhone or iPad as soon as the image is taken. In addition, you can also do Wireless File Tethering to a PC and/or tablet. 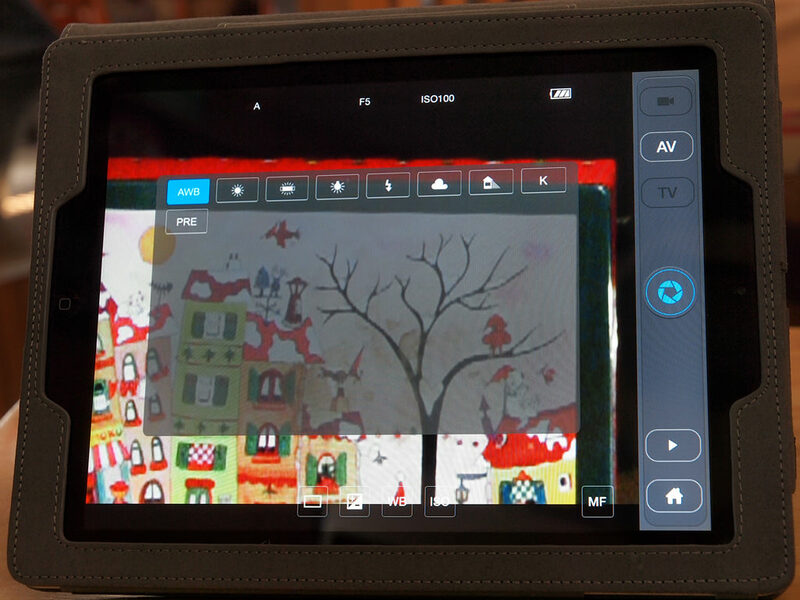 I have tested this function specifically on Lenovo Windows 8 tablet (Tablet 2). You have to install a PC specific application available via download from Xsories. This application works ONLY as a wireless file tethering application/mode. 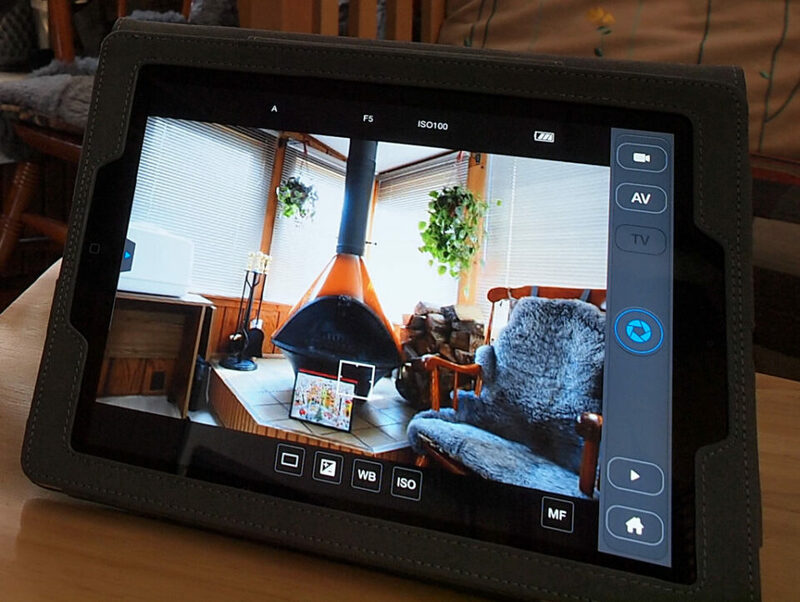 In other words, you cannot control the camera from the Windows 8 tablet, but you can receive files wirelessly with the following two options (in either case, Weye Feye device has to be physically connected to the camera): files downloaded directly from the camera to PC/tablet as soon as the image is taken OR files downloaded from the mobile phone/device to PC/tablet as soon as the image is taken VIA mobile phone (in this case, via the app on mobile phone that is wirelessly controlling the camera). The two modes of the application on PC – either files downloaded directly from the camera or files downloaded from the mobile phone/device CANNOT be mixed. If you are looking for wireless file tethering to your PC/tablet, the best option in this setup seems to be using it VIA mobile phone/device – because if you download the files directly from the camera, you cannot use Live View mode (since Weye Feye unit is physically connect to the camera). Bottom line – the current Weye Feye application for PC is for wireless file tethering only. You cannot use the PC/Windows 8 tablet to control the camera. 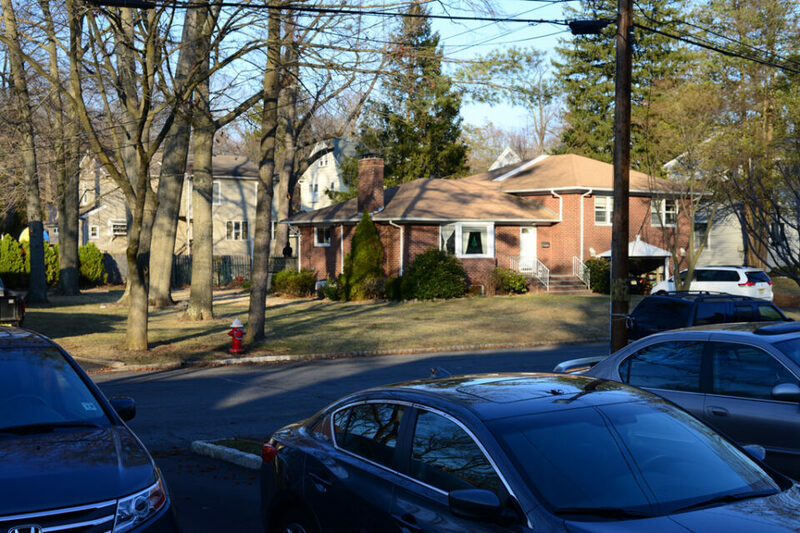 Some additional specifics regarding this test – the location is a typical suburban location. This means there is sufficient enough radio and wireless interference in the area: wireless secured network in my house, several more wireless networks located in nearby houses, cell phone transmissions, radio & TV waves (the town is about 30 miles away from NYC), TV dish networks, etc. By no means is this a complete review of the Weye Feye device. This review is based only on my limited testing of the unit, not under stringent control and not dedicating a lot of time to this. This review is not based on extensive field testing. I will re-assess the functionality and usefulness of this device probably over the next 1-2 years as I put it to real use. In general, I think this product could be useful under certain conditions and during specific photographic requirements. I think it is fairly easy to use and based on initial testing, described functionality and abilities are real. I have experienced a very brief (1 second) wireless network disconnect between iPhone/iPad and Weye Feye. This occurred several times during different connectivity sessions. The network connectivity was immediately re-established. I do not know the reason for this disruption and will be investigating underlying reasons for this. The manual and other available use information from Xsories could use significant improvements. Xsories has a dedicated Weye Feye forum where various issues and technical details are discussed. I believe this device will go through several iterations in maturity. I am currently working on a home-designed mounting option to easily mount Weye Feye unit and my iPhone on my D800. Once completed, I will post this mounting setup on my site’s blog. I hope this review is helpful to others and I will gladly try to answer any questions you might have in the comments section below. The Weye Feye device is available at popular stores like B&H Photo Video and Amazon for $249. This review was provided by Vlad Bubnov, a New Jersey based photographer who specializes in Abstract and Architecture photography. Visit his site fotograpfyart.com to see more his work. You can also find Vlad on Twitter and 500px. Does it add functionality to cameras like the d600 to auto bracket more than three shots? Steve, while I can’t test it on a D600, I believe the answer is yes. I just tested this on D800. D800 has native exposure bracketing of 9 shots. I tested this with 12 exposure brackets via Weye Feye. Just tap all the exposures you want to pick, tap Start and off it goes. And thanks for your feedback. Oh and great review btw! Looks good. But if you have an Android phone with OTG support, almost all of this functionality can be had for free with an excellent app called DSLR dashboard. You can use a USB cable or connect using WiFi through the nikon W1-UB. Using DSLR dashboard I was able to auto bracket 9 shots on my D600. Jaganath – thanks a lot for additional option and information. I also presume you meant WU-1b device from Nikon. Although I have not tried this, based on available information from Nikon www.nikonusa.com/en/ni…12-us-wu1b), WU-1b can be used only with limited number of Nikon camera models and has a stated range of 49 feet. Also, looks like DSLR Dashboard is an Android application only (at least at the moment). Dslr Dashboard is free (beta version) ,well done and can be used up to 300 feet in conjunction with tp-link mr 3040. 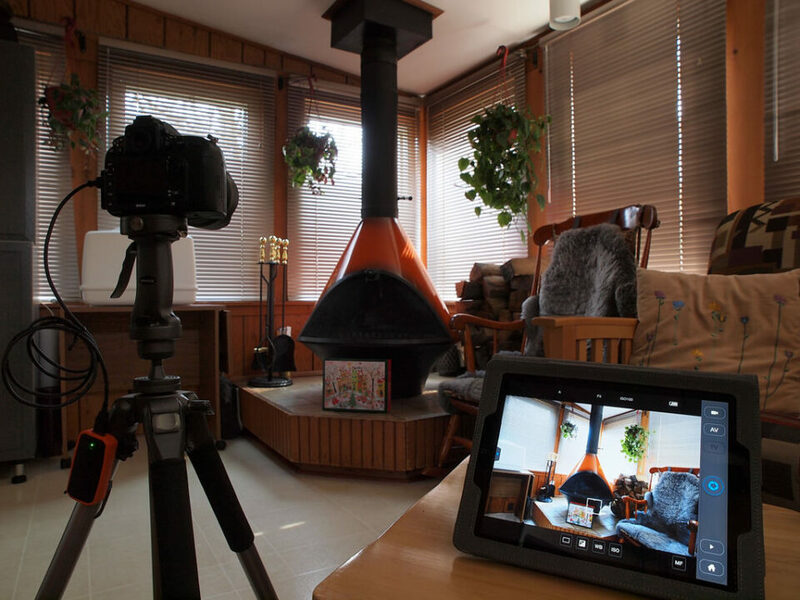 Its perfect for exposure and focus bracketing and time lapse! do you know for sure that the range on the tp-link is up to 300 feet? ive head some say its 40 feet. Hi Tor it is without a doubt more than 40 feet . I mostly use it for wildlife photography so more often than not there iscthings in the way like trees or branches. But with a clear signal between the two it gets close to 200feet. I was just hunting down information on the CamRanger last week. Curious if anyone has experience to compare with this Weye Feye. I’m interested in wireless tethering functionality. I have few questions, if you don’t mind. 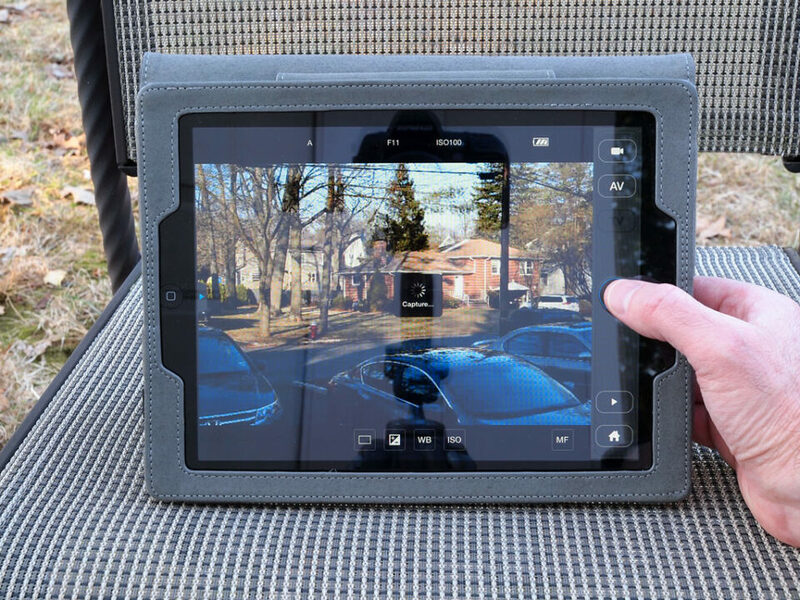 When tethering to a tablet – does it send RAW file, or JPG? – If I have my D800 set up with RAWs being written to CF card and small JPGs (just for preview) to my SD card – can you choose which files are sent? I’m looking for a simple “client preview” tether option, where my RAWS stay in the camera, and I’m not filling up a tablet with D800 files. I’m concerned with upload time – especially when shooting RAW with D800. Also – when tethered – if files go to your computer/phone/tablet – are they being written to a camera card as well, or it’s either/or situation? And finally – is there a rating system/pick-unpick option built in the app? 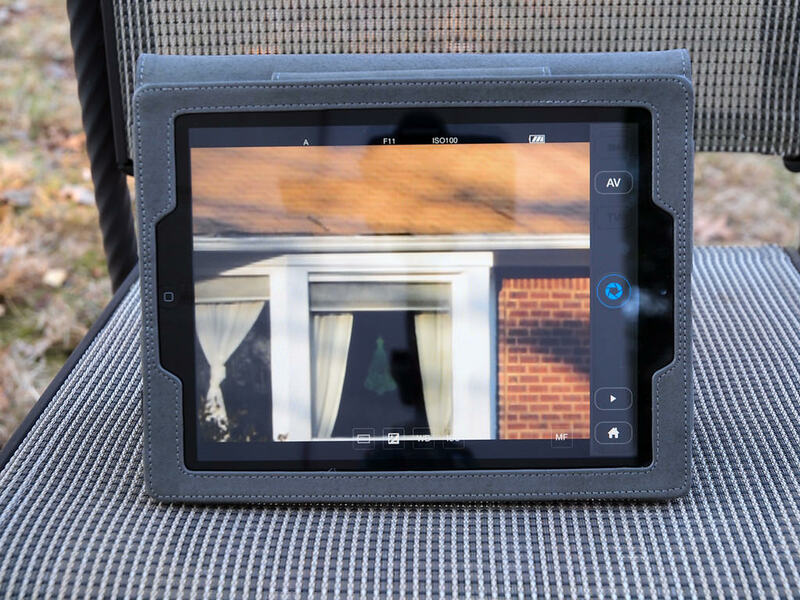 – again – comes back to a “client preview” thing – I want to be able to give a tablet to a client while shooting, or right after the shoot – so he/she can quickly make his/hers selects right on the spot. I’m sure some of the answers will come up once you play with it a bit longer, so thanks for pulling the trigger on Weye Feye and doing probably first review on it there is. Tio, I will test this setup out over the next couple of days and reply back with the outcome. Tio, I tested your requested setup out today. Here is the outcome. – Tethering directly to an iOS device (iPhone or iPad) – slightly different setup (because you are using different software) AND THE JPG FILE WILL DOWNLOAD ONLY IF YOU ARE DIRECTLY IN THE APPLICATION. If you switch to a different app (although the WeyeFeye app is still running) like Photo Album, the file WILL NOT DOWNLOAD. However, within the WeyeFeye app, after capture the file is downloaded and then is available to view in any appropriate app on iOS device. Download speed – seemingly much faster than to the tablet. Roughly counting in my head – about 4 seconds from the time file started to download. – Tethering via iOS device to Lenovo tablet. JPG file will NOT download to the tablet – only NEF file can be downloaded. That was very strange and after looking further into this, it became obvious this was due to JPG file being stored on the SD card (which in this setup, is not considered a primary card). Changing the setup on the camera and making sure NEF+JPG files were written to the same card enabled to download JPG file to Lenovo tablet. Vlad – thanks a milion! First setup you did – with tethering to either Android tablet or PC is exactly what I’m looking for. I’m not interested in remote control, so thanks as well to Duncan for sharing that link below. It may be just device I need. Thank you again for taking your time and sharing your test results. 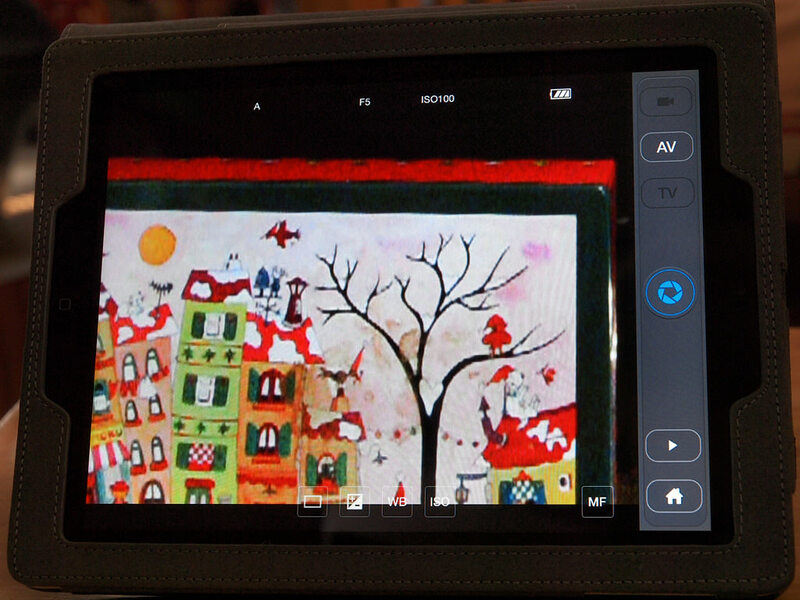 Tio, to send jpg/raw files to a smart phone/tablet, some sd cards just do the exact thing ( on both iOS and Android ). Such as the Eye-Fi card or some products from PQI or TOSHIBA ( forgive my laziness not to get you any review links ). They provide the function to download the photos at your choice or to be set to the fully download mode, or work with both. I myself got a Eye-Fi card for my D600 and i set it for the JPGs only. NEFs go to the other slot. Of course it also works with NEFs but with the WiFi embedded into its tiny size it sends files slow. NEFs will be time-consuming job and sending them to iPad just does not make sense. The reason i mentioning them here is that although the WEYE FEYE is a great solution to your needs, it just cost a lot compared to those SD cards with WiFi built in. Enjoy your CHECKING IMAGES ON SITE life~! Whatever happened to suffering for your art?? 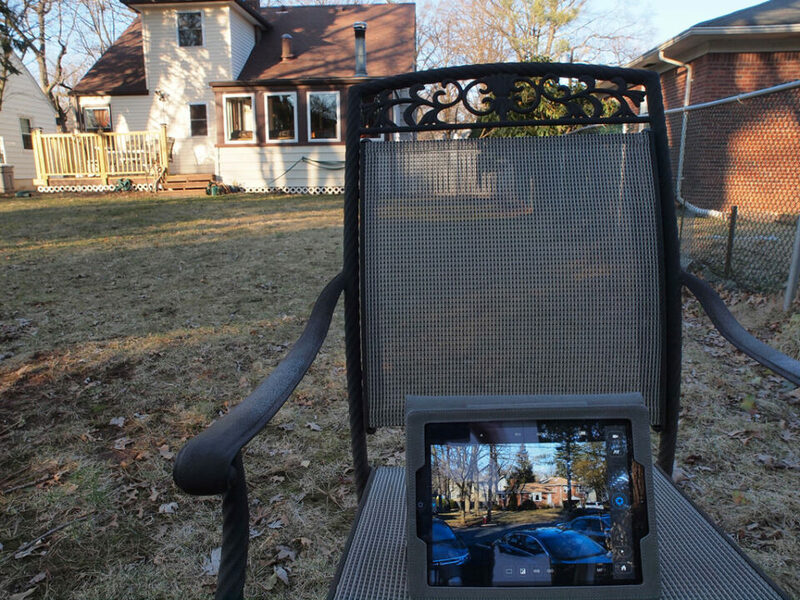 Do you know the quality of the playback on a tablette ? is it 1080p or 720p ? There is a “S” version of this at only 99$…. Any idea what the difference is ? 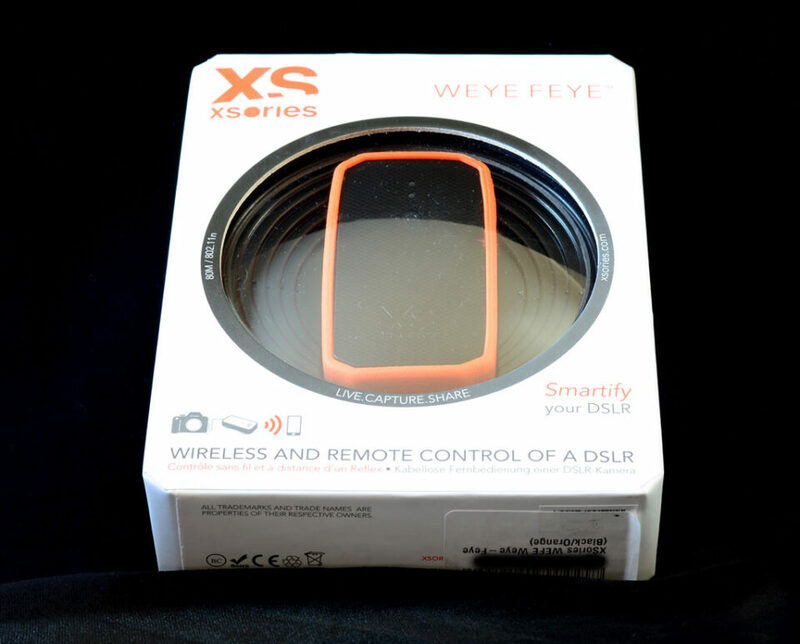 Duncan, based on Xsories description of Weye Feye S, this model is capable only of wireless file tethering. It does not say it provides camera control – I think that is the major and obviously significant difference. Regarding your playback question – can you please clarify what you are asking? Is it specific to playing back a recorded video? or a monitor pass-through as a Live View through the tablet? If it is latter (using it as a true pass through video monitor), then this will NOT work in a PC/MAC tethering mode. If you want to use it as a live video monitor, you have to do that through an iOS or an Android device. Again, please clarify so that I can better answer your question. yes I would want to know how good is the playback on an ipad (as pass-through as a Live View through the tablet) like you mentioned. I just wonder how good is the playback live view cause on the photos it does look pretty damn good but you never know..
Duncan, iPAD resolution is 1024×768 at 132ppi. When looking at iPAD as a Live View pass through device, it looks pretty good, but you can still see some slight artifacts. So it is not perfect, but I don’t think it is due to iPAD, but rather to what is coming out from the camera. Once the picture is taken and you look at JPG on iPAD, you don’t see the artifacts I am referring to. But obviously it is much better and easier to look at than the 3 inch screen. Also, the output depends on the light – the brighter the surroundings, the less artifacts you’ll see on the screen (but then you have a light reflection problem on the iPAD). Can the use of such a device allow us to have certain settings presets like the U1 and U2 are available as settings presets into which different seetings are saved for different situations. With help of such a device, can I have presets available on my D5100? Muhammad, this device does not add preset options to a camera that does not have this ability. how fast does the image pop up on the phone? can you review it immediately, or do you have to go to the gallery? Tor, I presume your question is how quickly the image of the shot you just took can be viewed/reviewed on the iPhone. I have to check this for you, as I don’t remember. I am going away for 2 weeks, but when I come back, I’ll test it out and reply back here. I just purchased a Weye Feye and I’m not seeing Live exposure changes from my Canon 7D. It shows live changes to white balance and focus but not aperture or shutter speed. I have to take a photo and view the preview to see if it was exposed properly. Is this correct? As a follow up to my question about Live exposure changes from my Canon 7D, I just want to let anyone know that it fixed itself. It just started working. As a warning to anyone considering the Weye-Feye, XSories, does not answer support emails, their support forum has been down for going on 2 weeks and they don’t have US phone support. I had high hopes for the Weye-Feye, but I’m sending mine back and trading in for a CamRanger. Jason, while I have not tried Xsories direct support (only used their support forum a while ago), it does seem that their support is majorly lacking (as I mentioned in my review of their manual). So this situation bites a big one, since a good product without good support is questionable. Is it working with Nikon D7100? It’s not in the list… Can it replace an ordinary remote control? Hege, I don’t know if it works with D7100 – don’t have one, so I can’t test it. This unit can indeed replace an ordinary remote control, but if all you need is a standard remote control function (without visual transmission), this is too complex of a device for that. Al, sorry for replying so late – I do not receive updates on this post any more. I probably cannot answer your question directly, because unfortunately as always, the devil is in the details. As you will see from my Tethering test in these comments, it was very specific to the units I had at home. Theoretically it should work with your laptop, but one never knows until it is tried – maybe your laptop will have a problem connecting to the Weye Feye – don’t know. You are welcome to drop me a note via my site (fotografyart.com) and maybe we can figure something out of how I can test it for you. I’ve received a question regarding usage of the Intervalometer option on this unit. I have just tried this out and indeed the intervalometer option does work. There are 3 settings in that option – Number of Shots To Take, Amount of Time Between Shots and if Auto-Focus should be turned on or off for each shot. The number of shots is changed with a +/- buttons on the app screen, I went up to about 1,250 – since it went over 999, I presume that it can probably go up to at least 9,999. Unfortunately the number of shots cannot be entered directly – you are forced to use the +/- only. If you just hold the on screen button, the numbers change pretty fast, but still – if you need to go to hundreds/thousands, it takes a bit of time. The Time Between Shots option goes in 1 second intervals from 1 second to maximum of 5 minutes. It also is changed with a +/- on screen button. Can you tell me if the Weye Feye works when an external strobelight/flash is mounted to your camera? Would like to know that too, especially with Phottix triggers or any third party. I didn’t gave much thought on Weye Feye before as it was priced as $249, $50 less than well proven Camranger. But now that it’s half the Camranger price at $149 Ihave reconsidered and ordered one! How the **** can I reset it? DAMN! Doesn’t help pushing that tiny button on the side. Waiting for answer from Xsories. FYI, the reason that more expensive “pro” cameras don’t have articulating screens is because the camera manufacturers think that built-in screens are more robust and weatherproof. They expect pro shooters to be harder on their equipment. That’s straight from the mouth of a manufacturer’s rep when I mentioned I was upset at giving up the articulated screen when I moved from a Canon 60D to a Nikon D810. is it compatible with nikon d810 ? Hey!! I just got the weye feye s, when I shoot the pictures show in my iPad but I can’t see them in my camara, do you any way I can fix this? Thanks! Great review. Hello great review! Please can anyone here help! I purchased this Weye Feye and most features work great with my D810. What I cant work out is where you check for new firmware? what the current firmware is as I don’t know if mine is old one. And then what the procedure is to get it on the Weye Feye. I have spents hours trying to find out on line, I know this is an old thread but I hoping theres people still available. Many thanks Jakob. Hi, i forgot the password of my Weye Feye. so what i did is reset it . Is there any default password for me to connect my phone to Weye Device. Because as of now i can connect my phone to the device because i dont know i forgot the password? Hello. I don’t know if you found an answer to your dilemma or not. But there is a reset pin hole on the side. It may be under the rubber covers. I had the same problem sometime ago. I love my Weye Feye.